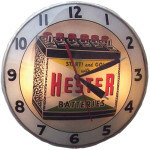 This circular green clock is a classic antique. The clock has a white face with a green border. The numbers are blue. 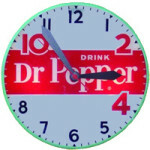 The top section of the clock has a small rectangle with “Pralen Cunningham” printed in blue. 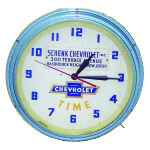 Below the center of the clock is the blue Chevrolet logo.